Early in July 1941, four months after the U.S. Congress had en­acted the Lend-Lease Pro­gram that began assisting Great Brit­ain and China in their defense against the aggressor states of Nazi Ger­many, Fas­cist Italy, and Im­perial Japan, Presi­dent Franklin D. Roose­velt asked his Sec­re­taries of War and the Navy to pre­pare a com­pre­hen­sive war pro­gram. The pro­gram was to address spe­ci­fic assump­tions regarding mate­riel needs and poten­tial U.S. adver­saries and allies. The col­lapse of the Soviet Union, which Ger­many had assaulted the previous June with 3.9 mil­lion men, 3,350 tanks, and 4,389 air­craft in Opera­tion Bar­ba­rossa, was one of the assump­tions that was reflected in the “Victory Plan” submitted to the president on September 1. On this date in 1941 the Chicago Trib­une, no friend of the presi­dent, used a source from the War Plans Divi­sion to pub­lish details of Amer­ica’s “Vic­tory Plan”—in­cluding the asser­tion that the U.S. would not be able to field forces in strength against Ger­many until mid-1943. The arti­cle went into highly speci­fic details on how the Vic­tory Plan was to be im­ple­mented. Secre­tary of War Henry Stim­son called the source of the leak “wanting in loyalt­y and patri­otism.” The Ger­man em­bassy in Wash­ing­ton was only too happy to cable sum­ma­ries of the article to Berlin, where Nazi mili­tary planners re­exam­ined their own poli­cies in light of the “in­con­tro­ver­tible intel­li­gence” the article pro­vided. All the more reason, Ger­many’s leader Adolf Hitler believed, to quickly finish off the Soviet Union (at war with Ger­many since June 22, 1941) and Great Brit­ain (at war with Ger­many since September 3, 1939) before America could enter the European conflict. Alas, Japan sprang a sur­prise on both Ger­many and the United States when it attacked the U.S. Pacific Fleet at Pearl Harbor, Hawaii, on Decem­ber 7, 1941. Hitler pro­fessed to his Foreign Minister, Joachim von Rib­ben­trop, that he had no alter­na­tive but to sup­port his Tri­par­tite treaty part­ner in the Far East. (In Decem­ber 1941, the major players in the nine-member Tripartite, or Axis, Pact were Ger­many, Italy, and Japan.) And so on Decem­ber 11, 1941, Ger­many, followed by ser­vile Italy, declared war on the United States. Upon the citi­zens of all three Axis coun­tries and beyond, the global war heaped misery, poverty, and devastation on an unprecedented scale. 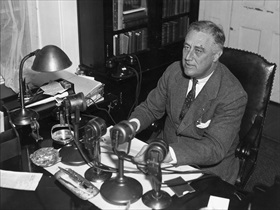 Left: In a radio broadcast (a so-called “fireside chat”) delivered on Decem­ber 29, 1940, Roosevelt promised to help the govern­ment of hard-pressed Great Brit­ain fight Nazi Ger­many by giving it mili­tary supplies while per­mitting the U.S. to avoid actual com­bat with Brit­ain’s enemy. Europe does “not ask us to do their fighting,” the presi­dent assured his lis­teners. 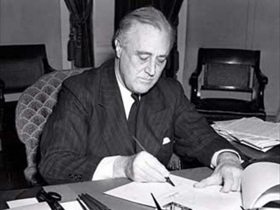 “They ask us for the imple­ments of war, the planes, the tanks, the guns, the freighters which will enable them to fight for their liberty and for our secu­rity.” As “the great arse­nal of democ­racy,” the mem­o­rable phrase FDR used in his address, “we must get these wea­pons to them, get them to them in suffi­cient volume and quickly enough, so that we and our chil­dren will be saved the agony and suf­fering of war which others have had to en­dure.” Roose­velt pursued this topic in his annual State of the Union address to the U.S. Con­gress on Janu­ary 6, 1941, ini­ti­ating a debate on what was to become the U.S. Lend-Lease Program. Right: The Lend-Lease Program became law on March 11, 1941, with the presi­dent’s signature. The pro­gram effec­tively ended the U.S. pre­tense of neu­trality vis-à-vis Ger­many, Italy, and Japan. Lend-Lease provided for the pro­cure­ment, manu­facture, and trans­fer (by loan, lease, or sale) of defense items (for example, air­craft, tanks, ships, trucks, muni­tions, and fuel) as well as food and ser­vices to coun­tries whose defense was deemed crucial to the U.S. The Office of Lend-Lease Admin­is­tration dis­bursed a total of $50.1 bil­lion (equi­va­lent to $650 bil­lion today) in assis­tance. The money repre­sented 17 per­cent of the total war expen­di­tures of the U.S. In all, $31.4 bil­lion went to Brit­ain, $11.3 bil­lion to the Soviet Union, $3.2 bil­lion to France, $1.6 bil­lion to China, and smaller sums to other Allies. The terms of the agree­ment pro­vided that any equip­ment was to be used until time for its return or destruc­tion. In practice very little was returned. Canada operated a similar pro­gram called Mutual Aid that provided $1 bil­lion in loans and $3.4 billion in supplies and services to Britain and other Allies.